Free Shipping included in this Block of the Month! The pre-fused, laser cut Sew Busy Bee Block of the Month is 8 months total and showcases 5 adorable Bees with a lovely applique border treatment! A monthly placement guide makes the applique a breeze. The block of the month includes all of the fabric you need to complete your quilt top, the binding, buttons, ric rac and all applique pieces are laser cut and pre-fused with Heat-N-Bond Lite. The backing fabric is not included in the block of the month. Scroll down below the pictures to view the details of everything you receive each month of the program! Finished Quilt Measures approximately 47″ by 47″. Fabric used is Riley Blake Designs, Moda Fabrics, LakeHouse Fabrics and Henry Glass Fabrics. Ships via USPS. International Shipping available. You will be charged a $5.00 sign up today and will automatically be charged $30.00 on the 10th of each month. The block of the month renews on the 10th of each month of each month and ship soon after. This is an eight month block of the month. 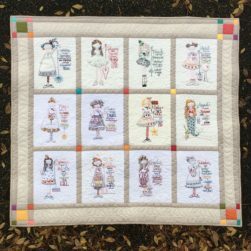 Sew Busy Bee Block of the Month and membership fees are non-cancelable. Want to share your instagrams of you with your Sew Busy Bee Laser Cut Block of the Month? Use the #sewbusybeebom hash tag.